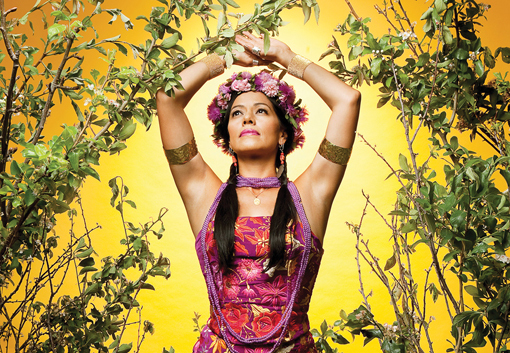 Lila Downs, the Grammy Award-winning singer-songwriter with roots in Oaxaca and the U.S., has often been described as a “Mexican chanteuse,” a outdated label that falls far short of doing justice to her creative vision, vocal prowess and riveting stage presence. Musically, her 20-year career has been sustained by a powerful, multi-octave voice that turns everything from Cuco Sanchez cantina heartbreak songs to torch-singer classics such as “La Llorona” into blazing, yet still sultry balms for the soul. Her original compositions are as apt to address political realities as they are to broach everyday life with a melancholic, brooding intensity. Or conversely, the songs will manifest themselves firmly as tender love songs that are both lullabies whispered to an infant and hypnotic incantations meted out to melt a lover’s heart. Over the phone from her home in Oaxaca, Ana Lila Downs Sánchez switches easily from Spanish to English. And while it’s been said countless times and seems almost pointless to repeat, she is truly and unassailably down to earth. With respect to her upcoming performances at the John Anson Ford Amphitheatre with the Grandeza Mexicana Folk Ballet Company on August 12th and 13th, she sounds genuinely pleased and excited. When she is told it would not be far-fetched to imagine her as the kind of artist who would have come into the world as the secret love child of avant garde performance artist and singer Astrid Haddad, renowned ballet folklórico choreographer Amalia Mendoza and actress Ofelia Medina, an international star and tireless human rights activist, Downs responds with sincere, unfettered laughter. The collaboration with one of LA’s most well-known professional dance companies is emblematic of a broader exploration into the possibilities represented by the addition of multiple dancers on stage simultaneously. They will, Downs suggests, be more fully able to animate and propel the musical narratives that distinguish her songs. “It’s about telling the story within, a story which is both melancholy and a celebration of our legacy as a people, as mexicanos, as Latin Americans and as indians,” says Downs, whose mother is of mixteca origin and whose father was a professor from Minnesota. Saddened by the recent clash between striking teachers and police in Oaxaca, Downs is even more determined to use her music in service of a humanitarian response to the tragic circumstances that have engulfed Mexico in a storm of unprecedented violence which has escalated steadily during the last 30 years. “Violence provokes more violence. Why continue provoking with confrontation and repression? If we have the same concerns: better education, respect for students, respect for teachers, respect toward life and society? Corruption needs to be eliminated in all areas: from presidents, labor leaders, senators, and congressmen who don’t support anti-corruption reform and accept bribes of all kinds,” Downs wrote on her Facebook page with regard to the “enfrentamiento,” which left six dead and 100 injured earlier this summer. With songwriting partner Paul Cohen, her husband and musical collaborator since their marriage in 1990, she is also in the middle of composing material for an original stage production slated for Mexico City’s Auditorio Nacional in early November. Audiences will be encouraged, says the four-time Latin Grammy winner, to attend in calavera face paint. They will bear witness to a music and dance spectacular that addresses some of Mexico’s most pressing socio-political concerns directly. “It’s a theater piece that uses music and dance to communicate a story and also addresses important political issues,” says Downs of the November D.F. concerts. She was moved, she explains, by the social movements that have erupted in recent years to challenge government corruption and its inability to reign in the violence that has slowly eroded basic security and safety throughout Mexico, among them the “#yosoy132” student initiative, the movement in response to the disappearance of 43 students in Ayotzinapa, the recent atrocities in Oaxaca and the DREAM ACT activism that seeks immigration reform, an end to deportations and the separation of families in the wake of Donald Trump’s attempts to scapegoat Mexicans and lay blame for North America’s problems squarely on their shoulders. Balas y Chocolate, an album issued in March of 2015, was inspired by the Día de Los Muertos tradition, according to an article in Billboard Magazine written by Judy Cantor-Navas shortly after the record was released. A profound musical take on the life and death cycle, Balas is her nod to the pre-Columbian Mesoamerican belief system that fuses loss and mourning with an annual celebration where the dead are warmly invited to attend as guests of honor. The album—her 8th studio recording—is graced by collaborations with the legendary Juan Gabriel and Colombian superstar Juanes. Ironically, as if part of a cruel cosmic joke, the record ultimately came to represent the greatest emotional and spiritual challenge Lila Down’s had ever faced. In the middle of production on a record meant to honor Mexico’s Day of the Dead tradition, her husband Paul was diagnosed with a terminal strain of cancer. Her husband’s health has improved dramatically since the original diagnosis, she is happy to report. With his illness in remission, Downs is upbeat about his prognosis and eager to follow through with the slew of touring and recording projects in the pipeline as she makes the transition from status as an ethnically ambiguous cult favorite to universally regarded musical powerhouse. The November concerts in the Mexican capital are clearly an outgrowth of the concept behind Balas y Chocolate. In this case, however, all roads need no longer lead to the camposanto, (cemetery). After her highly anticipated LA-area appearances this month at the Ford Amphitheatre with Grandeza Mexicana, a dance company she is excited to work with because “they are great creators,” Downs will travel to San Antonio, Texas for a concert at the Lila Cockrell Theater, where she will be joined onstage by the Guadalupe Dance Company. “The Guadalupe Cultural Arts Center has always been the organization that brings us to San Antonio,” says Downs. So it is fitting, she says, that the Guadalupe’s resident dance troupe will be part of the innovative, interdisciplinary explorations that enable Lila Downs to transcend language, geography and genres to an even greater degree.